Recently music fans across the country participated in Record Store Day, a day celebration of the eclectic nature of independent record retailers. This special day brought on many special releases including the limited edition split side single “Spoonful Weighs a Ton”. On one side you had the original Flaming Lips version (Recorded in 1999), and on the other side you had Mastodon’s cover. 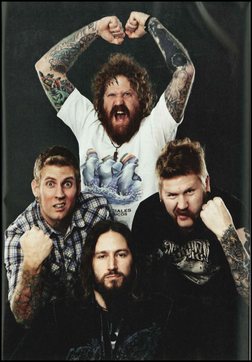 I have to say even though both tracks were great, Mastodon did an amazing cover that was on par, or better than the original. The track starts off with a piano much like the original. Then the verse comes in and is sung by Mastodon drummer, Brann Dailor. The track then goes into a heavier chorus that is accentuated by the bands riff power, which was not seen in the original. When the second verse comes in this is where I think the Mastodon version excels due to the smoothness in Dailor’s voice. A heavier section comes in, and then the song exits. Some might say that this version is too close to the original, but I disagree. I think Mastodon added their own mojo to the track that made it just different enough. Make Sure to check out both, and check with your local record store to see if they still have a copy of this split.